I wanted to bake some cookies at M’s house, but I was worried that if I used the heavy equipment needed for a good cookie dough (electric mixer for example to cream the butter), I would wake the baby! So I looked online and found this recipe by Cook’s Illustrated magazine, which runs the brilliant tv show America’s Best Kitchens. They are truly amazing cooks, and combine artistry with a certain technical chemical mastery. Anyway. 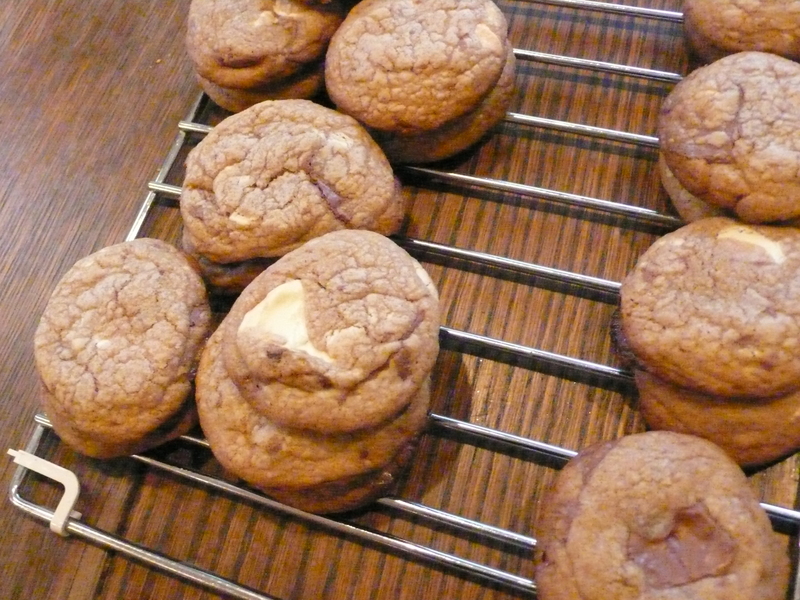 I adapted these cookies a little bit (as all cooks will) but kept with their basic formula. This is a no mixer cookie, and makes the softest, most pliable, “lemak” dough I have ever used. And it takes like 15 minutes to put together. And seriously? Amongst the best chocolate chip cookies I have ever tasted. I have made them probably about 4 – 5 times with AngelKitten and Sawa during this World Cup, and people are obsessed by them. They get cravings, and beg us for just a few from our secret stash. We have shared them with friends and family, and just keep getting asked for more. I was thinking of making other things – a berry crumble or the most phenomenal carrot cake in the whole wide world – but for ease of making and for pleasure given, these just cannot be beaten. Hot from the oven they are … well, orgasmic is a word I would use. Enjoy! 1. Depending on the “rise” please adjust your baking soda. First batch I used about a teaspoon, and they were a tad thicker than second batch where I used about 1/2 teaspoon. Depends on your preference really. 2. Use best quality chocolate (NOT cooking chocolate, and not chips if you can avoid it)… Get good chocolate, and chop it up. ALWAYS makes a cookie taste better. 2 cups chocolate chunks – when I first made these I used Callebut white + milk cut off a block – now I use Valhrona buttons smashed up, a mix of dark (70%), milk (65%) and white. Measure the flour in a measuring jug, add the baking soda (1/2 tsp for preference) and set aside. Over high heat, in a large non stick skillet, melt 10 tablespoons of butter. Once melted, keep on heat, swirling constantly, until the butter has browned well, and is toasty and nutty. You want it browned and caramel-y and dark and gleaming, but not burnt. You will know from the smell, but be careful because it goes brown very quickly. The darker it gets (without burning) the more caramel notes you will have in your cookie – so be brave, but dont let it go over to the burnt and bitter side! Transfer the butter to a heatproof bowl (or even a large saucepan or pot!). Add the remaining 4 tsp butter (it will foam up) and using a wooden spoon, mix in until melted. Add sugar, salt and vanilla and whisk until incorporated. Add egg and egg yolk, and whisk again. Let mixture stand for about 3 – 5 minutes, and then whisk again for about 30 seconds. Continue to do this (letting mixture stand, and then briefly whisking) 3 times in total. You will see a remarkable difference in the mixture from when you started, to the final whisking. It will have set up, thickened, become almost stiff liquid caramel in consistency. Amazing. The resting is key, so please do not think you can skip the above. Using a spatula or wooden spoon, mix in the flour until just combined. Let rest for a minute or so, and then mix in the chocolate chunks. You will find you have the softest, silkiest cookie dough you have ever handled. Let rest for a few minutes while you heat up the oven to 375 degrees and line a cookie tin with parchment or baking paper. You should be able to get 8 cookies (of 1 tablespoon balls each) onto the cookie tin. If you prefer larger cookies, go right ahead but reduce the number of cookies on the tin! They spread! This should make approx 32 smaller cookies or 16 larger. Bake for 7 – 9 minutes, or until just browned on the edges. Take out of the oven and allow to cool for a few minutes (they will set up) before transferring to baking sheet. Try and break at least one so you have some cook’s rights before theyre all devoured! Yum! Sounds divine – did you use salted macadamias? I think the saltiness would just add a certain panache to them 🙂 I have sprinkled these with a *tiny* bit of sea salt just before theyve gone into the oven … out of this world. Good luck and keep enjoying them cookies!